Adrenal fatigue plays a significant role in weight gain, yet is not noted by scientists or health institutions as an identified condition. This condition occurs when the adrenal glands become exhausted and do not operate correctly. Adrenal Fatigue Syndrome reduces the proper production of hormones. It can often come from stress or long-term medical illnesses and infections. In summary, adrenal fatigue causes tiredness at any point in time during the day. It creates that feeling of having no energy and the feeling of needing to lie down. Many people suffer from adrenal fatigue, yet do not even know it. This condition causes tiredness, anxiety, depression, memory loss, allergies, lack of concentration, insomnia, overall exhaustion, and many more issues. Tiredness and exhaustion alone can contribute to weight gainand other health issues. Almost every adult experiences adrenal fatigue at one point in time or another, yet many experience it long term. It can be difficult to pinpoint adrenal fatigue as the problem, since most symptoms are tied into other health issues. Nevertheless, many people face this serious problem every day. Recovery from Adrenal Fatigue Syndrome is not ordinary, since the condition is not noted as a real condition by many institutions.Successful weight management must start with ensuring optimal liver function. Let’s take a closer look. 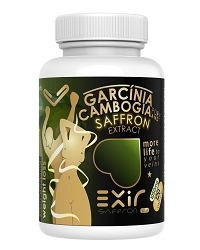 Garcinia Cambogia helps suppress the appetiteby containing the extract known as Hydroxycitric acid (HCA.) HCA increases levels of serotonin, which is a neurotransmitter inside our brains that makes us feel good. Low levels of serotonin in the brain can lead to depression and the feelings of anxiousness. Higher levels of serotonin, promoted by Garcinia Cambogia, helps the brain deal with stress that often leads to overeating. It also makes the brain acknowledge it is full sooner, leading to a reduction in eating. Saffron (Crocus sativus L) also helps suppress the appetiteby increasing serotonin levels, leading to the control of your appetite. It also helps with emotional eating, by making the brain trigger feel good feelings.